Savour the taste of tradition with Bateel. 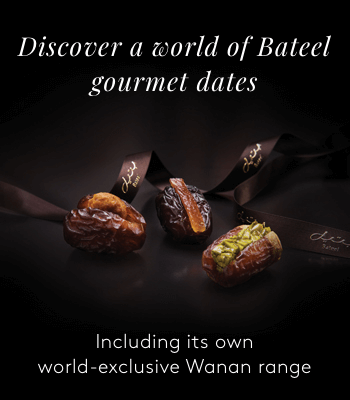 Rooted in Arabian culture and hospitality since 1936, Bateel enjoys an unparalleled legacy as the world’s only gourmet date grower, producer and seller. Our organic date farms are nestled in a fertile oasis, in the Al Ghat region of Saudi Arabia, north of the capital Riyadh. Here, by the historic green valleys of the Tuwayq Mountains, over 100,000 date palm trees grow, basking in the temperate climate and naturally flowing sweet water for irrigation. This unique terroir lends to the inimitable taste of every Bateel date. Using the best farming practices, Bateel’s cultivation techniques are kept as close to nature as possible. Date palm trees can live as long as a century and produce up to 150 kilograms of fruit each year. The species are dioecious – meaning there are males and females – and pollination is dependent on human assistance. Bateel painstakingly places branchlets of male white flowers amongst female blossoms in a process that requires constant care and attention. Only female trees produce fruit and, once pollinated, the tree begins to produce fruit after six years. Branches of our date palms are regularly thinned, even if it means cutting away 50 percent of the fruit. The thinning process ensures optimum air circulation and space, so the remaining fruits grow to their best potential. As they begin to ripen, maturing dates are enveloped in well-ventilated cloth to deter birds and insects, which also helps avoid the use of pesticides. 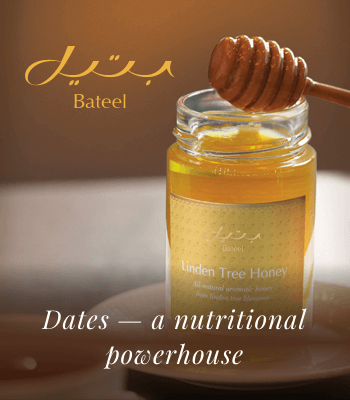 Each year Bateel harvests more than 2,800 tonnes of the highest quality, organic dates. However, it’s a complex process, as every date is hand-picked. Staying true to tradition, agile farmers climb great heights – often up to 20 metres – without the aid of modern machinery or equipment. They have to return to the same tree several times over the course of the season in order to pick each date at the perfect time. As soon as the dates are harvested by hand in Saudi Arabia, they are immediately stored to halt further ripening and lock in flavours. The fruit is then cleaned using state-of-the-art technologies, before being assessed and graded to match stringent standards for size, colour, translucency and skin condition. This ensures quality and consistency, and it’s why every Bateel date looks as you’d expect: the best of the best. The dates are then transported to our world-class production facility in Dubai, where a team of dedicated artisans prepare and stuff dates with premium nuts, candied fruits and chocolate. The fruit is incredibly delicate, so it’s a highly-skilled craft that’s still done entirely by hand. Like the word ‘bateel’ itself – which refers to the young offshoot of a date palm that can be used to grow into a new tree – the company continues to forge new culinary frontiers. Bateel has evolved from its origins as a pioneer in the gourmet date market to a leader in the international luxury food sector. Across the Middle East and North Africa, food is the foundation of every celebration and culinary traditions are revered. Thousands of miles away, this passion is also mirrored in Umbria – the agricultural heart of Italy. Bateel reflects the best of both worlds thanks to its Arabian roots and premium ingredients sourced from a family-owned estate in the historic mountain village of Arrone. This picturesque 9th century settlement is perched on the rugged rocky slopes around the Valnerina Valley, nestled along the Nera River Park and famed Marmore Falls. Since 1850, Bateel’s Umbrian partners have demonstrated unparalleled skill in crafting traditional Italian specialities, including pastas, grains and legumes. With the same care that goes into harvesting our dates, each product from the estate reflects a time-honoured legacy. Take the example of the humble pasta. The process starts with the planting and harvest of durum wheat semolina – the hardest wheat grown in the world today. This high-grade semolina helps the pasta retain its distinctive firmness when cooked and imparts a delicate nutty flavour. At the estate, pasta is entirely bronze drawn. This means it’s pushed through a traditional die, which leaves tiny ridges that help the pasta bind better with sauces and seasonings. This process sets the brand apart from other large-scale, factory-produced pastas that tend to be slick and smooth. Finally, the pasta is slowly air-dried over a day or two – the process is never rushed in order to preserve its nutritional characteristics and natural profile. Thanks to the relationships formed over high culinary standards, Bateel produces and sources some of the finest foods in the world. We bring the best of the world on a plate – from artisanal Italian pastas and gourmet French patisseries to innovative Arabian-inspired creations such as date chocolates, date-olive tapenade and sparkling date juice. One of the leading purveyors of gourmet food experiences, Cafe Bateel is a celebration of culinary inspiration. With 26 locations, our cafes blend centuries-old Arabian hospitality with the elegance of modern European bistros to create a uniquely inviting setting. Every Cafe Bateel is designed with nature in mind, with hues of olive green, warm wooden floors and framed photographs of our historic date farms. Reinforcing the earth-to-plate connection, our menus place an emphasis on simple yet refined fare, combining a Middle Eastern essence with Mediterranean diversity. Premium, natural flavours are the foundation of every dish, whether it’s organic ingredients imported from Umbria or exquisite seasonings sourced fresh from the Levant region. Finishing every meal, a cup of Bateel coffee is a ritual in excellence. Choose from 100% Arabica blends, served with a Rhutab date in an homage to Bedouin tradition. The date is served cold and melts in the mouth, perfectly complementing the heat of the coffee and elevating its intensity. 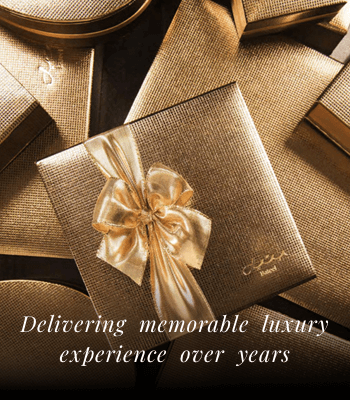 Spearheading culinary experiences of distinction, Bateel presents a full range of gourmet confectionery and savoury products, refined gifts and more. Welcome to our home. Welcome to the world of Bateel.